The unique AABSPEC #2000-A Multi-Mode System gives you the widest choice of parameters available for your spectroscopic experiment. Temperatures from -170o C to 950oC. Pressures from 2000psig to ultra high vacuum (now extended to 10 -8 torr). Multi-mode optical techniques giving you Transmission, Specular Reflectance, Large Angle Reflectance (LARI), UV Irradiation, Raman (now with the added benefits of our advanced Raman window technology). Fully demountable windows give you the choice of all spectral regions. 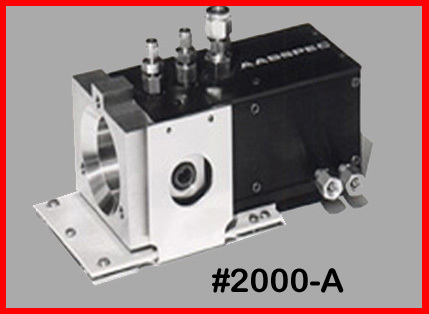 The advanced manufacturing methods developed by AABSPEC have been used to ensure the structural integrity of the #2000-A Chamber so that there are no welds, no brazes. As standard, the chamber is sculpted entirely from a single piece of 316 stainless steel. Other materials are available on request. All electrical connections are external to the chamber, just one of the many special features of the design which enhance safety and performance. The built-in fluid circulation system ensures that the chamber is held at near ambient temperature throughout your experiment. Our Digital Temperature Programmer, #STP-6, gives you a very wide choice of heating or cooling rates from 0.2oC/min to 300oC/min while a read-out thermocouple gives you instantaneous sample temperature. #2000-A has been developed over the years to handle the most demanding customer applications. Ideal for Catalyst research, the #2000-A is also widely used in Polymer and Materials Research. If your samples are solids, liquids, films, coatings, powders, catalysts or polymers, call us now and benefit from our technical experience in these areas.